New faces and systems make Endless Space 2 an Early Access title worth keeping an eye on. With just three games under their belt, Amplitude Studios have quickly made the list of developers whose progress is worth following. Their penchant for great storylines and unique factions is clearly reflected in Endless Space and Endless Legend while the detour into roguelike territory that was Dungeon of the Endless shows that they’re comfortable moving out of the 4X Strategy sphere. As they’re still pumping out expansions for the stellar Endless Legend, it just so happens that Endless Space 2 also became available on Early Access. The (early) Early Access version comes with four of the eight of the factions that will be available at release. The Sophons and the Cravers are familiar faces to those who’ve played the previous title while the Vodyani and the Lumeris are newcomers to the series. Each of these factions looks and plays differently. The Vodyani, which quickly grew to be my favorites, live on Arks, giant spaceships that need to orbit a planet in order to be able to access improvements. Their other ships can also harvest essence from foreign populations, which can then be used to purchase population units on your Arks or recruit other Arks. This basically gives you an early military advantage, as Arks are strong offensive spacecraft, and the potential to relocate your bases. I enjoyed the option of mobility; however, you can’t always be on the move if you want improvements to come by. The Lumeris revolve around trading and Dust. They do not require colonizer ships, instead being able to purchase outposts on planets they can colonize right away. The Cravers return with a bunch of tweaks. They are unable to make peace with other factions only while the militarist party leads the empire. In Endless Space they were always on the warpath. On top of that, Craver population members actively consume the planet. This forces you to constantly expand and plan things in a different manner when playing the Cravers due to the lack of a stable long-term home system. The Sophons are science-oriented, being able to know what has been already researched by other empires and, also, travel faster. Their weaker ships, though, brought my playthroughs to quick ends due to being sandwiched in between Cravers and Vodyani. The largest addition in Endless Space 2 is that of political parties, empire-wide forms of government and laws. 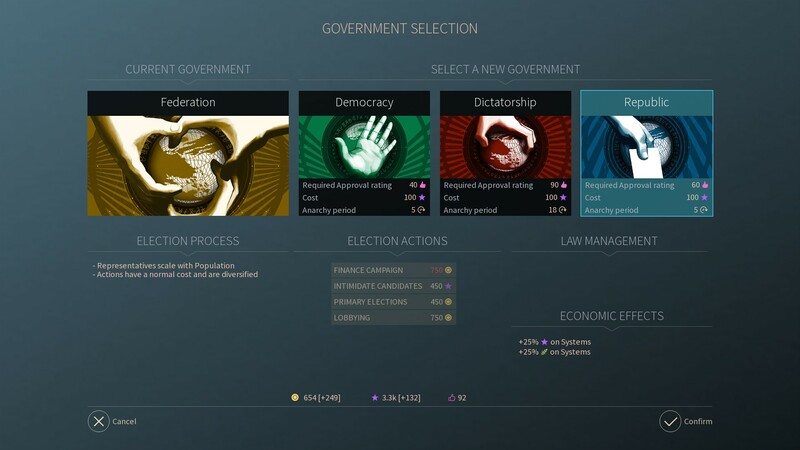 Depending on your faction, you’ll begin with a certain form of government and a leading party. Cravers initially run under a dictatorship under the militarist party while Vodyani are a federation with religious orientation. The form of government dictates how elections are handled and gives you different actions you can do to sway public opinion in certain directions. Dictators will employ Manpower, resource also required for ground invasions, while democracies will use their influence in this regard. Each of the six available political parties has a default law activated when they come into power. These laws give all sorts of passive bonuses that are beneficial to your empire. The laws also have thresholds of party approval that must be met in order to be able to be active. With the proper research, you can have a larger number of laws active and get the option to change the initial form of government. Political parties appear in an organic way, based on what’s happening around you. If you’re a Sophon, you’ll start led by the scientists, but a declaration of war from another empire alongside the recruitment of ships will prompt militaristic voices to rise up to the point where they might win the Senate. This can work for you or against you as, instead of militarists, you can end up with pacifists leading you while space insects are knocking at your door, aiming to steal all your sugar and then enslave you. The population mechanic has also been tinkered with a bit. 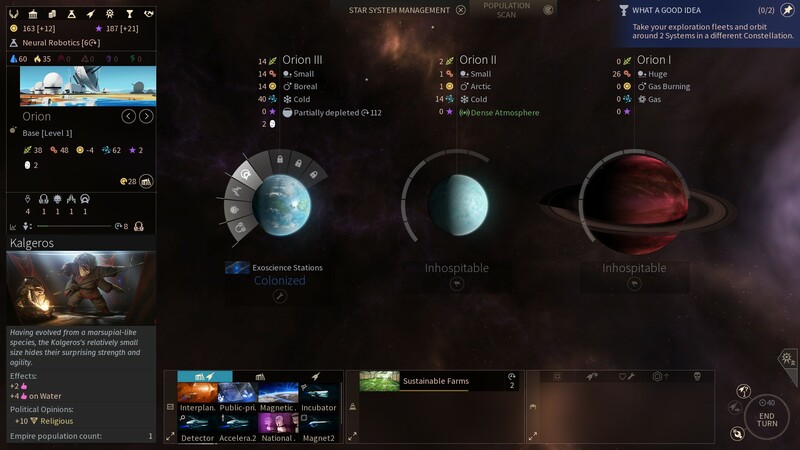 Your planets will now attract different types of populations. Depending on the minor factions and other empires around you, there’s a chance your next population type will be one of theirs. Different population types come with different benefits; however, getting a militarist-oriented pop on one of your planets may quicken the rate at which the party gains approval. Then, of course, there’s the joy of having Cravers on your non-Craver world, which prompts the appearance of the countdown to the moment when the planet’s resources run out. As far as I am aware, there is no way to get rid of a population once you’ve got it, which sets the stage for some potentially interesting turn-outs. However, part of me is also rooting for a deportation mechanic somewhere down the line, to get those pesky Cravers to eat someone else’s planet. The FIDS system is now the FIDSI system, due to the addition of Influence, a resource introduced in Endless Legend. This resource is mostly used in politics but also in convincing minor factions to join you. Planetary specializations aren’t present by default anymore, instead requiring research prior to being able to be built. Research is also handled similar to how Endless Legend did things, with potential unlocks being available in four areas of improvement over five eras out of which three are available at the moment. Combat has remained mostly the same. Instead of cards, you now pick an action plan from a set of three and watch cinematic battles unfold. Of course, the ways in which you customize your ship’s offensive, defensive and support modules alongside the hull types in your fleet play a large part in how the battles pan out. There doesn’t seem to be an empire cap to how many ships you can have. Fleet sizes are the only ones limited by command points which can be increased by an upgrade later on. When more than two fleets are contesting a planet, you have to battle each enemy fleet separately instead of initiating a large battle with all the present fleets. I’m hoping, that large battles will be introduced somewhere down the line. Conquering a planet from a faction you’re at war with prompts a truce for a couple of turns. Regarding the sound and graphics, there’s little to complain about. The soundtrack is done in the same style as the one in Endless Space and instantly transports you into the game’s world. Graphically, things have improved significantly. 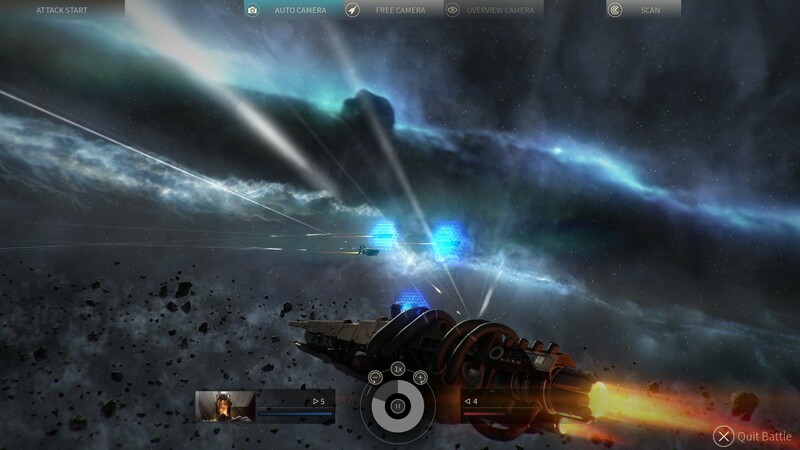 The interface is much slicker now and the ships ooze personality. 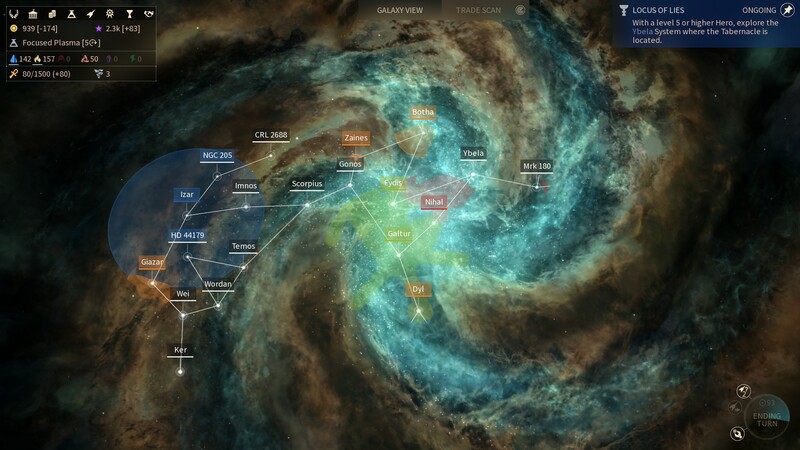 The galaxy map with its planets and fog of war is simply a joy to look at. I shouldn’t forget to mention that, depending on the level of zoom you can get overviews on a series of elements important to your empire. Being the early version that it is, there are plenty of things still to be added. Just two of the six victory conditions are in: score and military. The AI seems to have a propensity towards not wanting to do business with you. Then again, there aren’t really factions that dabble too deeply in diplomacy at the moment. Something I would definitely love to see are effects that change things in a more drastic way for each of the factions. These could apply especially to laws, political parties. At the moment they feel a little too safe, being just passive modifiers. Regarding lore and quests, there’s not much there as of now, save for the initial quests for each faction and a side quest that’s common to all. There’s promise to the writing, with quests giving you choices regarding the way you want to approach them. Having spent some time with this very early version of the game, I’m eager to see where Endless Space 2 will go during its time in Early Access. What’s there already is most certainly promising however, at the same time, surpassing their previous 4X strategy titles won’t be an easy feat for the people over at Amplitude Studios. Whether you choose to do it from a distance or by hopping onto the Early Access train, Endless Space 2 looks like a game you want to keep your eye on.